One of the things we try to do here at All Mesopotamia is shine a light on the not-sung-enough heroes doing great things for Mesopotamian history. This time we’re shining a light on someone you might remember being mentioned in a few of our posts or tweets, or you might have his awesome website bookmarked. 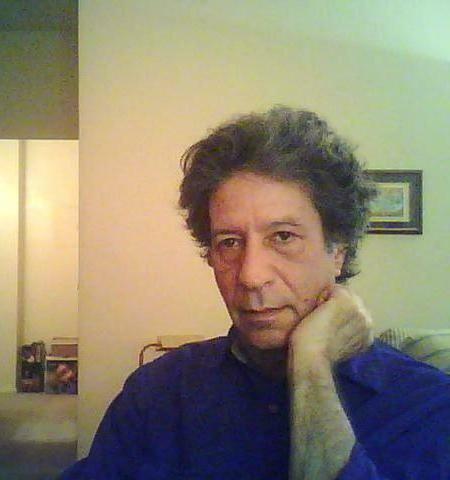 He is Mr. Jerald J. Starr, aka sumerianshakespeare.com. Simply put, Starr is your (and our) go-to guy for anything Sumerian, like the Standard of Ur (pictured above). His passion for the rockers of the cradle of civilization is what drives him to not only gravitate toward what’s already known about them, but also to make his own fascinating discoveries of a people long gone, but whose all-encompassing legacy of civilization still reverberates thousands of years later. Now, I asked Starr a few questions to find out what he is all about. I was pleasantly surprised by all his answers, and think you will be too! 1. You’re kind of an enigma. I communicate with you regularly about the history I cover on the blog, but I hardly know anything about you. Who is this enigmatic expert I’m talking to and what is his background—what makes him the expert he is on everything Sumerian? Your readers may be surprised to learn that I am not a “properly accredited” Sumerologist. I am just an amateur. I have no formal training in the field, neither do I have a college degree in the subject; although with the thousands of hours I’ve spent researching Sumerian history I could have easily earned a PhD, perhaps several. If I am to be considered any kind of “expert” (your word, but thanks) it’s only because Sumerology is my obsession, my sole preoccupation. Often when my friends are talking to me, I barely hear what they are saying because my mind is 4,000 years away, in the land of ancient Sumer. It also helps that there are very few other experts in the field. At last count, there were only about 400 Assyriologists in the entire world, of which only a few are dedicated to the Sumerians exclusively. One day it suddenly occurred to me that I am probably “the world’s foremost expert on the Standard of Ur.” Then I realized that I am probably the world’s only expert on the Standard of Ur! 2. Ever since I came across sumerianshakespeare.com, it has been my go-to website for reliable information and great pictures. In fact, my only complaint about your website is that you only cover the Sumerian material. Having said that: what drew you to the Sumerian civilization in particular out of all the others that thrived in Mesopotamia, and do you ever delve into any other group of Mesopotamian peoples? When I was in college, I read The Story of Civilization by Will and Ariel Durant. It wasn’t part of a reading assignment for a class I was taking; I was reading it for my own pleasure. I remember how impressed I was that the Sumerians seemed to invent civilization entirely on their own, when the rest of the world was still living in the Stone Age. I didn’t pay much attention to the Sumerians after that; I had other interests to pursue. Fast-forward several decades later to about five years ago. I was with a girlfriend, Loring. We were looking at a display of cuneiform tablets at the Frist Museum here in Nashville, Tennessee. I said, “Wouldn’t it be great to own one of these tablets? I’d love to own something so ancient, when writing and civilization were first invented.” Those were the exact words I used, “when writing and civilization were first invented.” I didn’t give the remark a second thought until two months later when Loring gave me a cuneiform “tablet” for my birthday. At first I didn’t know what it was. It was an odd cylindrical shape with writing down the sides. I later found out that it was actually a Gudean “foundation cone” from the temple of the god Ningirsu. I decided to write a thank-you note to Loring, in Sumerian, to show my appreciation for her sweet and thoughtful gift. Nothing fancy, just a few signs written on notebook paper. Little did I know what I was getting into. 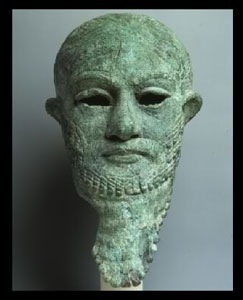 The Gudea Foundation Cone was Starr’s inspiration. It’s not for nothing that Sumerian is known as the world’s most difficult language. Even the Sumerian scribes had difficulty writing it! I was immediately frustrated by the fact that it was difficult to learn even a few Sumerian words, much less learn enough grammar to write a complete sentence. I could have just strung some words together like beads, they didn’t have to be grammatically correct; but noooo, that wasn’t good enough. So then it became an intellectual challenge. As described in “Adventures in Cuneiform Writing,” it became an all-consuming passion, to the exclusion of everything else – like eating, sleeping, and bathing. Even at the time I would sometimes wonder, “Why am I so obsessed? Who cares about this stupid dead language?” Sometimes I seemed more “possessed” than merely obsessed. It was a lot like that scene in the movie Close Encounters of the Third Kind, where Richard Dreyfuss feels compelled to create a huge clay mountain on his kitchen table, without knowing why. As it turns out, there was a predestined purpose for all of this. 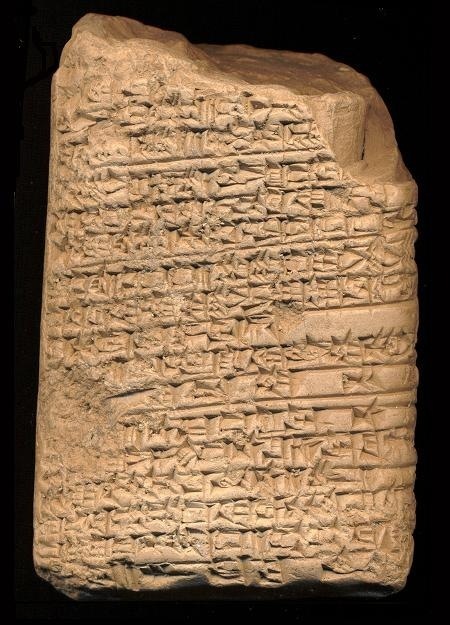 If I had not been so completely obsessed with writing Sumerian correctly, I never would have learned enough of the language to translate (“decode”) Tablet #36, the story of The Great Fatted Bull. 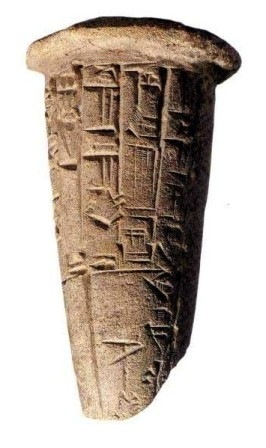 This tablet would not give up its secrets to just anyone, to some sort of “dilettante.” It was Tablet #36, along with my reawakened interest in Sumerian history inspired by the Gudea cone, that led to all my other discoveries in Sumerology. Starr cracked the code of the mysterious Tablet #36. This leads me (finally!) to the second part of your question. I consider myself to be a Sumerologist, in particular, rather than an Assyriologist (someone who studies Mesopotamian history in general). As a matter of fact, I make a deliberate effort to sort out the Sumerians from the Akkadians and the Babylonians, who are routinely jumbled together in the history books. I usually write about the Akkadians and Babylonians only in reference to the Sumerians. I feel called upon to be an advocate for the Sumerians, to be their voice. So for the time being I will continue to dedicate my efforts solely on their behalf. As for the rest of Mesopotamian history, we have All Mesopotamia for that. Starr concluded that this otherwise anonymous statue bears the actual true face of Gudea. Read about Starr’s research here. 3. What does your research on the subjects you discuss on your website entail? Do you work alone, or are you a part of a team or organization? I quickly exhausted the limited selection of books on Sumerian history at the local library. I mostly use the Internet for my research. I use the CDLI, ePSD, ETCSL, and Sumerian.org for the language studies. Museum websites are also a good source of information. 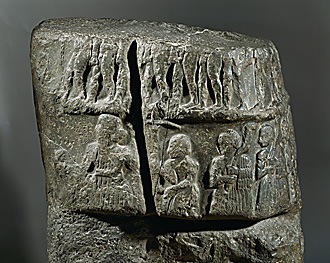 I enjoy seeing Sumerian artifacts in museums all around the world without leaving the comfort of my living room. One of my favorite research methods is image searches on the Internet, since I’m always trolling for good pictures to use on my website. This is how I found Tablet #36 in the Library of Congress, Ur-Namma in the Metropolitan Museum of Art, Gudea in the Barakat Gallery, and other original discoveries. I work entirely alone. This is partly my preference. I am in contact with a few professional Sumerologists, but I am being boycotted by the other Sumerologists. I am the pariah of Sumerology. I have to admit, it’s my own fault. On December 6, 2008, I proudly posted my translation of Tablet #36, the story of The Great Fatted Bull. It was my first major discovery. The very next day, Bendt Alster, a world renowned Sumerologist, posted on his website that Tablet #36 wasn’t really about The Great Fatted Bull. He thought it was “A Dialogue between Two Women.” Mr. Alster was a pioneer in the field of Sumerology. If he said Tablet #36 wasn’t about The Great Fatted Bull, then who was going to listen to an amateur like me? So I might have over-reacted just a tad. I posted a new page on my website challenging him to a “Sumerian Showdown,” my translation against his. I am usually not so confrontational, but I was deliberately being provocative. I was hoping that someone would try to refute my translation, and failing that, would be forced to confirm it. I also thought I was being very clever and funny; satirical, like the scribe who wrote Tablet #36 (I was defending his work as well as my own). But I soon realized that I was just being a smart-aleck, to use the polite term. After all, Mr. Alster was merely expressing his academic opinion, which he stated in a polite and civilized manner (unlike me). Eventually I deleted the page from my website and sent a letter of apology to Mr. Alster. He made a gracious reply, so all was well between us. He was a really nice guy about it, which doubly made me feel like a heel. He passed away suddenly and unexpectedly a few years later, so I am grateful that I was able to make amends with him. But the damage had already been done. I had thoroughly alienated other Sumerologists. They still hold it against me and I can’t say that I blame them. In the meantime, the story of The Great Fatted Bull remains the only proven translation of Tablet #36. 4. 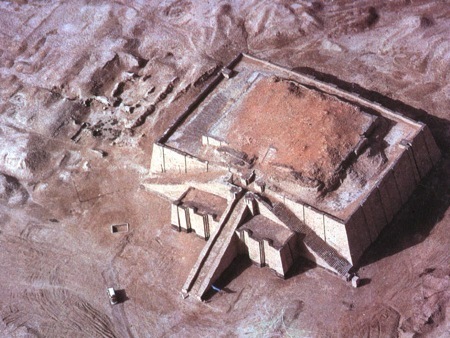 The Sumerian civilization is where our modern world began to take shape. Writing, literature, the wheel, agriculture, and according to a very enthusiastic Discovery Channel documentary, earth-shattering beer…all these things and more. And yet it’s not nearly as popular as the Egyptian or Greek civilizations, which as great as they were with their own innovations and inventions, in my mind, they were mostly reinforcing and building upon foundations laid by Mesopotamians. Drawing from my frustrating experience, I must ask: why do you think my Western Civilization class in college detailed the Egyptian mummification process, but only briefly mentioned that writing was invented in Mesopotamia and very little else about the land between two rivers? I know what you mean. When I try to talk to someone about the Sumerians, they get a blank look on their face and say, “Who?” I always want to reply, “The Sumerians; you know, the ones who invented civilization.” I don’t actually say this, of course; that would be rude. If people don’t know much about the Sumerians it’s probably because so little Sumerian history has survived to the present day. You can read all that remains of Sumerian history in a single afternoon. On the other hand, the Egyptian civilization continued for 2,000 years after the Sumerians had disappeared, so there is a lot more Egyptian history to cover. I think that’s why a class in Western Civilization gives a brief introduction to the Sumerians and then quickly skips over to the Egyptians. Surprisingly, very few Egyptian artifacts date back to the time of the Sumerians. If we only had Egyptian artifacts dated before 2000 B.C., we would know as little about the Egyptians as we do about the Sumerians. Only the Pyramids are as old as the Sumerians. You are right in pointing out that the ancient Greeks, Romans, and Egyptians built upon the foundations of the Sumerian civilization. So even if we don’t always realize it, the Sumerians are still with us today, 4,000 years after they passed into history. 5. What are, or are there, challenges that you or any other Sumerologist face in this discipline, as opposed to an Egyptologist, for example? The main challenge for a Sumerologist is that he/she doesn’t have a lot of material to work with. Very few Sumerian artifacts have survived the millennia — a few ruined temples, some pottery shards, a few statues, some jewelry. This is the opposite problem faced by Egyptologists. They cannot sink a spade in Egypt without hitting an artifact. A modern Egyptologist has tons of artifacts to work with (literally); more than can process in several lifetimes. Of course, a Sumerologist has access to countless cuneiform tablets, hundreds of thousands of them. The problem is that 97% of these tablets are “Administrative” (receipts, ledgers, inventories, etc.). Only 3% of the tablets are “Literature” (history, hymns, poems, proverbs, etc.) where the Sumerians actually tell us something about themselves. Imagine an archaeologist 4,000 years in the future trying to reconstruct 21st century America by using business accounting records. Egyptology is a very old science; many ancient Greeks and Romans were “Egyptologists.” By comparison, Sumerology is relatively new. The modern world didn’t know about the Sumerians until the late 19th century. The world is still in the process of discovering the Sumerians. As a result, much of the information about the Sumerians is either contradictory or just plain wrong. Even the experts don’t always agree on it. You and I both know from personal experience the difficulty in finding reliable information on the subject. It’s hard to know who to trust when every major museum in the world includes some erroneous information about the Sumerians, even the Iraq Museum! 6. What do you think most distinguishes sumerianshakespeare.com from the other Sumerian websites? First of all, it is the number of pictures I have on my website. The other websites have only a few, with the exception of All Mesopotamia. I realized that most people have no idea what the Sumerians looked like. We can easily imagine the ancient Greeks, Romans, and Egyptians because we’ve seen so many pictures of them, but most people have no “visual concept” of the Sumerians. By including a lot of pictures of the Sumerians, I hope to make them more familiar to the modern reader. The face of Ur-Namma, one of Starr’s original discoveries. Second, and more important, are my original discoveries. Many people think that I am merely parroting information I got from other sources, but most of my website is devoted to my own discoveries. 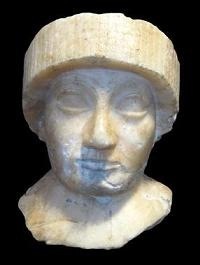 Some of my major discoveries include Tablet #36, the portraits of Gudea and Ur-Namma, both Sargon victory steles, and everything about the Standard of Ur, among several others. I have also made a lot of minor discoveries, more than I can keep track of. I have to admit, I am very proud of these discoveries. They are the most noteworthy things I have ever done in a life that is otherwise devoid of accomplishments. A detail from one of Sargon’s victory steles that Starr wrote about on his site, here. More of the same, I guess. I’m hoping I can make some more discoveries. 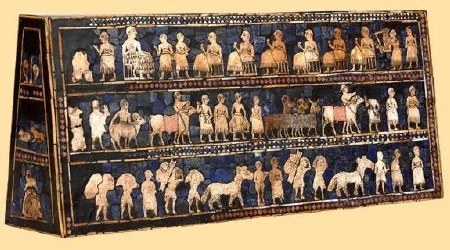 In any case, I will continue to write about the extraordinary civilization of the Sumerian people. It’s my new-found calling in life. This is what I was meant to do. And we all agree that this is what you were meant to do, Mr. Starr.